(b. 1957) – theatre, film, radio and TV actor; lecturer at PWST in Kraków, Dean of the Acting Faculty, since 2006 a member of the Programme Board of the National Creativity Centre Foundation, professor of theatrical arts. The holder of the title of the Distinguished Cultural Activist. In 2005 received the Gloria Artis Silver Medal for Merit to Culture. In 2004 he was honoured with the Knight’s Cross of Polonia Restituta. One of the most outstanding living Polish actors, known from a innumerable roles – at the theatre (in particular in Kraków), film and TV productions. In 2014 he suffered a stroke which excluded him from his professional activity for months. At the end of 2015 he symbolically returned on stage at the STU Theatre. 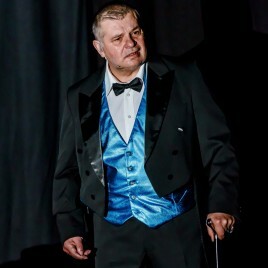 In 2016 he played a part in Wieloryb The Globe staged by Mateusz Pakuła, at the Łaźnia Nowa Theatre.